We had an event at work and when it was over I asked what was to become of the helium balloons. There were no plans for them other to toss them so I gathered them up and attached them to my bike. I thought it would be fun to ride home with them. I left work and rode four blocks to Riverfront Park. It occurred to me that some child was going to see the balloons and ask for one. Sure enough, I'm halfway through the park and I pass a family of four. No sooner do I pass when a little girl's voice calls out. Can I have a balloon? "Sure." I stopped, got off my bike, and asked what color she would like. 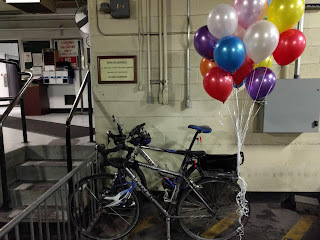 Well, that turned out to be impossible because the flailing of the balloons while I rode had braided the ribbons together. While her parents and I discussed how we could extract a balloon of the right color, the girl offered up her own idea. You could give us all the balloons. "Exactly what I was thinking," I said. I untied the bundle and handed them to her and her brother. Big smiles and thank you's all around.